The Stanley Kubrick science fiction epic with "HAL" the computer. Large gatefold box in great condition. Five tales of terror from the Crypt Keeper (portrayed by Sir Ralph Richardson!). A classic anthology of horror stories from 1972. Like new! Three stories of Poe brought to the screen by Vincent Price, Peter Lorre and Basil Rathbone. Price is in all three episodes. The last one with Basil Rathbone is the best (CASE OF M. VALDIMIR); watch Vincent Price melt like the Wicked Witch of the West! Like new! Out of print. Boris Karloff's last great role. After this he only did four Mexican quickies. Peter Bogdanovich directs and co-stars. Karloff basically plays himself under the name Byron Orloff. He's an aged horror vet thinking about retiring. Edgar Rice Burroughs' Tarzan of the Apes tale of the jeweled city of Opar. Silent serial with music score. Two tape set. Gordon Scott as the mighty jungle man from Edgar Rice Burroughs novels. Buster Crabbe stars as the classic Ape Man of the jungle! An early Tarzan treat. A young opera singer (Betty) gets her big chance when the previous star of a production of Verdi's Macbeth is run over by a car. Convinced the opera is bad luck she accepts, and becomes the target (in Argento's unmistakable style) of a psychopath - a man she has been dreaming of since childhood. 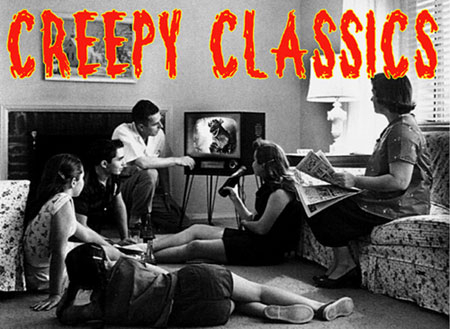 Similar to a William Castle movie like HOUSE ON HAUNTED HILL or 13 GHOSTS. A thriller with twists and a gimmick. The gimmick is brief frame flashes within the movie of evil faces and demonic expressions. Nutty and cool. Original uncut version. Aliens from out of this world create a gigantic metal monster to destroy earth. Their ally is a scientist who develops an giant amphibious creature. Can planet earth's Godzilla defeat the robot AND Titanosaurus, the other creature? Heaven help us. Gulp. Stars Lex Barker. Sword and Sandal thriller! An actual SP (high speed) version of THE TERROR from 1963 with Boris Karloff. Usually there are only EP or LP versions of this film out there on VHS. An actual SP (high speed) version of THE TERROR from 1963 with Boris Karloff. Karloff in a Corman quickie that's really very good. The ghost of a dead woman romances a soldier. A young Jack Nicholson co-stars. Stars William Tracy. One of many newspaper comic strips to be serialized for the big screen, Terry and the Pirates brings Milt Caniff's characters to blazing B movie life. Loads of action and a great gorilla too! 2-Tape set, like new! Actor Vincent Price takes crazy revenge out of theatre critics. Vincent Price as a wronged actor, starts on a revenge spree against his critics. The 1940 version starring Sabu and wonderful special effects. In excellent, like new condition of THE THING (1951), the sci-fi monument to motion pictures! A compilation of weird, spooky cartoons from Kino on VHS. Used tape in great shape, just slight wear on box edges. Raymond Massey in the H.G. Wells science fiction landmark film. Stunning special effects. Like new. Suspense thriller starring Joseph Cotton, Valli, Orson Welles and Trevor Howard. Alfred Hitchcock classic thriller filmed in England and starring Robert Donat and Madeleine Carroll. A colorful space opera with Metaluna Mutants and alien landscapes. Faith Domergue stars in this true sci-fi classic. The Three Stooges in shorts and rate TV appearances. Included is a U.S. Savings Bond film, with Frank Sinatra, Curly Howard's first short film, a 1949 TV guest shot and more! Incldes three of the Stooge's funniest shorts. One of them features a werewolf! Classic Boris Karloff hosted TV Show. This is the hour episode called THE PREMATURE BURIAL starring Karloff himself! You either love Tod Slaughter movies or you don't. The formula's basically the same in all his films: Sleazy, rotten guy (Slaughter), is after a young pretty woman. His lecherous designs lead to deceit and murders. He's stark raving mad! In a black protective snap case. Science Fiction in all it's glory from the 1950s with TOBOR! A robot with power beyond our comprehension! Stars Vincent Price and Elizabeth Shepherd. Vincent Price's final Poe film with director Roger Corman. A lush movie shot in England and includes real ruins. A story of the supernatural and murder. Like new! A masked phantom killer is on the loose in a western town. Cool make-up for a western at the climatic unmasking scene. Stars Roland Young, Joan Blondell, Billie Burke, Patsy Kelly, Carloe Landis and George Zucco. Blondell is murdered by a cloaked phantom in a castle. Her ghost recruits Topper to return to the castle and scene of her death to solve the eerie mystery. One of Boris Karloff's last movies. A rock from outer space needs women's blood to grow and Boris assists. Stars Jack Haley in a mystery-horror spoof. In large Film Classics box. The classic story of The Trojan Horse deception for the big screen. Stars Steve Reeves and John Drew Barrymore. Rare, rare VHS! Two episodes from the 1950s TV'S READER DIGEST program. The first is about an American becoming a bullfighter. THe second featues a rare appearance by Vincent Price as a missonary prisoner in China being brainwashed. A monster from Venus hatches on earth and grows into a reptilian behemoth! Ray Harryhausen stop-motion magic. Two classic episodes of the world's greatest TV show, Rod Serling's THE TWILIGHT ZONE. This tape includes: NIGHTMARE AT 20,000 FEET with William Shatner (the gremlin on the plane's wing) and THE ODYSSEY OF FLIGHT 33 (a plane breaks the time barrier - dinosaurs!). Hammer's re-telling of the classic Jekyll/Hyde story with Paul Massie and Christopher Lee.